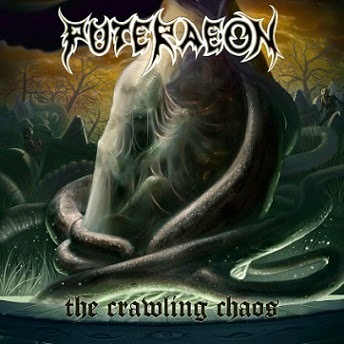 Puteraeon's latest opus, The Crawling Chaos, is very unlikely to breach the Swedish sound-off barrier, being that it's nearly a direct tribute to classics like Left Hand Path. But that aside, a few listens through the thing have convinced me that one should not be so quick to write them off, if only because they seem to really engage with their subject matter, engage with their songwriting and in the end provide us a pretty genuine window into the death metal ideals of their forerunners. This is accomplished almost entirely through their strict attention to melody and harmony, far more so than the usual runts of the Swedeath litter, which provides just the correct amount of musicality and atmosphere to save this one from the chaff-bin and put it with the rest of the wheat. That's not high praise, and this disc doesn't deserve such, but you could listen to this front to end, the entire 45 minutes and not really come away too bored or banging your head into a wall at the vast level of derivation it subsists upon. In short, it's Left Hand Path with a few cruder grooves and d-beats shuffled in to balance out its more interesting ideas with something for the pit ghouls. The set-up is great, with the grimy, doomy grave dirt melodies inaugurating the 7-minute, sepulchral "Wrath" raising the bar for my expectations, and a number of riffs across most of the individual tracks providing some follow-through...only just not enough that it seems incredibly level or consistently memorable. Rhythm guitars are ugly, Swedish, but in accounting for themselves they incorporate a fair share of melodies that travel off in some fulfilling directions. In fact, had the band changed production styles and tones to something more unique, and dropped a few of the bland d-beat drive-punk passages, we could be hearing a fresher take on the death metal nostalgia that has started to corrode its welcome. Alas, The Crawling Chaos is planted too firmly in its safety zone. There are occasional riffs which deviate, like the opener of "The Abyssal" which is a grinding, evil paean to Consuming Impulse-era Pestilence, and in truth about 3-4 of the songs here would have made for a killer EP, but like a lot of old school stuff I get, the 'good' parts are watered down by a surrounding miasma of 'meh'. Vocals are a little blunter and more monotonous than, say, L-G Petrov, but they at least compliment the growling with some even further guttural bursts. I can feel the repulsion bass lines spewing out sewage on the bottom end, but they never present themselves as something that deserves the same attention as the other instruments (a common fault in this style). The drumming is steady and has a live show feel to it, but in terms of beats and fills there's nothing really creative happen, it just happens to work within the context of the style like you'd expect from most bands playing at this level. The Lovecraft lyrical theme seems more or less serious, as it was on the first two discs these guys released, but this is such a commonplace thing in the 21st century that you wonder what the old corpse of everyone's favorite horror author would think about this. Personally I don't feel that The Great Old One would choose Swedish death metal as his entrance music when he steps in the ring against humanity (in a brief, one-sided bout). Nah...something more chaotic, orchestrated, layered and probably impossible for our species to comprehend. But the Mythos, and cosmic horror is such a fascination that it doesn't really get old, even when you're using a title like The Crawling Chaos which has been done before many times. So, yeah, not any better than the last two Puteraeon discs, but at the same time, no worse. You like Demonical, Revel in Flesh, or the original purveyors of this sound from that important 1990-1993 era, and you're not tired of the endless recycling of those ideas, then I don't imagine this one would put you out much.